Fans around the world adore the best-selling No. 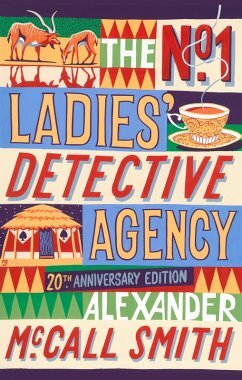 1 Ladies' Detective Agency series and its proprietor, Precious Ramotswe, Botswana's premier lady detective. In the first book of the bestselling series, Mma Ramotswe - with help from her loyal associate, Grace Makutsi - navigates her cases and her personal life with wisdom, good humour and the occasional cup of tea. Her methods may not be conventional, and her manner not exactly Miss Marple, but she's got warmth, wit and canny intuition on her side, not to mention Mr J. L. B. Matekoni, the charming proprietor of Tlokweng Road Speedy Motors. And Precious is going to need them all as she sets out on the trail of a missing child, a case that tumbles our heroine into a hotbed of strange situations and more than a little danger . . .
Delightfully different, THE NO.1 LADIES' DETECTIVE AGENCY offers a captivating glimpse of an unusual world. Es geht sich zwar etwas schleppend an, aber dann möchte man das Buch nicht mehr weg legen. Kein Krimi im herkömmlichen Sinn, und doch ein bißchen wie eine botswanische Miss Marple. Ruhig, spannend, farbenfroh,schlicht und wunderbar afrikanisch: Ein Lichtblick!